Stinky Dog Beads' $35 Giveaway for Fabulous Beads! She is ba-a-a-ck!The wonderful bead supply shop with the memorable name! Kitty Bozzini obviously named Stinky Dog Beads after her pets. But there is nothing stinky about what she sells. Indeed, the last giveaway had many readers basically drooling over her handpicked items! And I wouldn't be surprised if you did so again. One lucky winner of this giveaway is going to have a very hard time picking from her store. I had the same problem trying to pick just a few of my favorites. Anyone make beach or nature inspired jewelry? Take note! 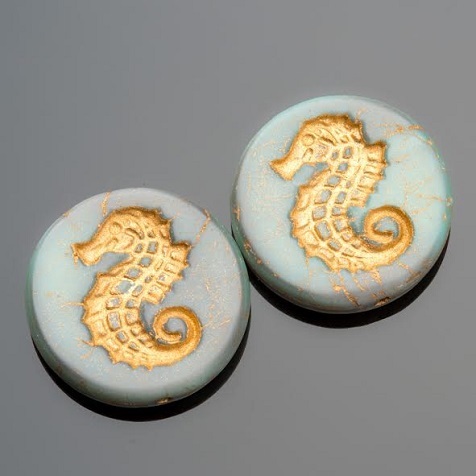 She has restocked with more sea horse beads. They are gorgeous and ideal for anyone who can't or won't wire wrap versions of this beautiful sea creature. I do not know anyone who doesn't like picasso beads! Her new sugar skulls and flowers are delicious too! Another favorite is her owl bead collection. As you can see from this picture from Stinky Dog Beads' Facebook, Kitty has a great sense of humor! While you wander all over her store, remember that Stinky Dog Beads offers many ways to save when you shop there. 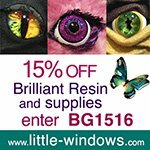 There is also a discount code for first orders. Before you click through to check out Stinky Dog Beads, grab some tissues okay? You know, for the drool. If you want a chance to win a $35 gift certificate for some of Stinky Dog Beads fabulous supplies, please make a comment below. Make sure you leave contact info below if you do not have an online shop or blog. It ends in a week's time at 6 pm EST Monday, September 5, 2016. I will pick the winner randomly and announce the results as soon as possible after. So be sure to leave a contact email if you don't have an online link or make sure you come back and check! Otherwise I will redraw in a week. Good luck! These are some sensational looking beads!! Is she the one that has those gorgeous dragonfly coin beads as well? Hoping very much for this one. Am a blog follower, Facebook follower and subscriber & can be reached at retro-grrl@hotmail.com. You're right, I'm drooling over these! Yes, I'm drooling! She sure has put together an interesting & inspiring collection of beads & supplies, many of which I've never seen in any other shop. 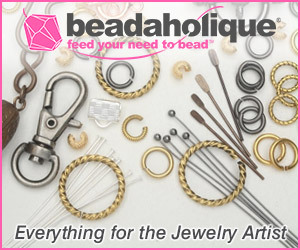 I am always searching for unique beads & components that are reasonably priced, & I now have a new source to add to my list. 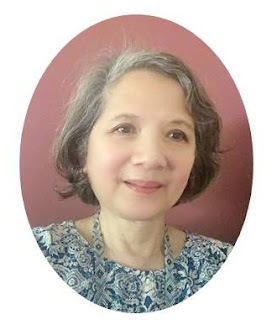 Pearl, as always, thanks for everything you do for the beading/jewelry community, through your emails, blog, Facebook, etc. Beautiful beads! I would have a hard time picking , but would definitely go for some of the hooters! Ha-ha! You're right, Pearl, I'm drooling over these! Would love to win this. Thank you for the opportunity! Super cute beads!! Love them and the variety!! Even though people tell me I have enough beads (perish the thought!!) I could have so much fun with these!!! She has a great selection Pearl, and I would love some of them! Wow! Such a variety of yummy beads! Love the sugar skulls. Please enter me in the drawing. Thank you! Please, please, please pick me. I love those beads! Hi Pearl, I love Stinky Dog Beads and am so glad you have a great friendship with them to offer wonderful giveaways from their shop. I would love to win. Please enter me in the giveaway. I am a blog follower and subscriber. I would love to win these beads!!!!! Oh the things I could make with them!!!!! Thanks for the giveaway!! Thanks Stinky Dog Beads for this giveaway and thank you Pearl for doing this. She has beads you don't see everywhere. I really like the "critter" ones. I mean the sea horses and owls. 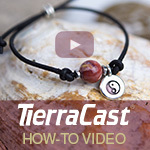 Thanks for another great giveaway and for telling about another great bead source. I'd never heard of Stinky Dog Beads before. Love Stinky Dog Beads and would be over the moon to win this. Blog follower and subscriber. Look into my eyes....I own a stinky pug...and beads...thanks. Making your jewelry unique so it stands out from the herd requires a lot of work. But Kitty's store makes that job easier to do with her diverse offerings. The hard part is saying no to everything she has to offer. Just tweeted about the post and giveaway. Ooh, I'm in love with the woven cord and the ceramic beads! Yes! Already drooling. Sure hope I win this one. I'm a blog subscriber. The beads you highlighted have me eager to place an order. It would be nice to win the giveaway! I am a subscriber. cmcocon at gmail dot com. Oh , yes, I love them all !!! I am a fervent follower , and I must say you manage to thrill us with your awsome giveaways ! I would love to win and pick from "Stinky Dogs" amazing inventory! I love the name of your company!!! Would love to win. Beads are really nice. What a great giveaway! I've never shopped with them, but I think I will start soon. I would love to win this. The beads are very lovely. I am blog subscriber. Hi Pearl, you've done it again! Another yummy give away. I would love to win a $35 gift certificate to spend at Stinky Dog beads!! The more beads the merrier I always say! Deb I subscribe, tweeted, pinned, shared. Love the seahorse and owl beads that are pictured. 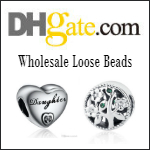 I am a blog subscriber and would love to win some of these beads!!! I enjoy the eclectic variety of Stinky Dog's beads! Just browsing their collection is enough to jog you out of creative 'vapor lock' and right back into a veritable flood of ideas! I also LOVE the logo! It would be a TREAT to be chosen. Thank you for the opportunity! I just had to check out Stinky Dog Beads for myself and OMG, I'M IN LOVE!!! I found so many things that are a MUST-HAVE for Fall (other seasons as well :-D )! I don't know that I can wait to hear of the winner before placing an order. Please enter me in your drawing. I haven't had an opportunity to order yet from Stinky Dog Beads, but I always look forward to the newsletter and Facebook ads. The product photos are absolutely spectacular! Love Stinky Dog Beads! Always a fun selection! I would love to win some new beads. I have never checked out Stinky Dog Beads but I'm getting ready to right now! Owl fan here ~ ooh, seahorses... and who doesn't love a stinky dog? What a fun, eclectic store! I love everything that Stinky Dog offers, especially the sea turtles and the hooters! Thanks for this awesome giveaway! Thank you so much for all of the entries....Please let us know if we can ever help in any way info@stinkydogbeads.com. I follow you via Bloglovin Pearl. Thanks for all the inspiration! I ordered recently and I love Stinky Dog Beads! Told them I couldn't help but laugh when writing the label for my new folder...Stinky Dog...haha. Thank you for the chance to get some more. I love Stinky Dog beads ! those square picasso's just caught my eye. i adore the sea glass beads...ty ! I just placed my first order with them the other day. They have such nice beads! I've never seen these owl beads before! I'm excited to czech out (see what I did there? ;) ) your website! Recently found Stinky Dog Beads and love their products. Such Beautiful Beads! Oh the Ideas they invoke! There is something so special about unusual beads. And they are often very hard to find. Stinky Beads Rocks! fabulous beads. Is there a physical store in Oregon? I love the beads. The Sugar Skulls would make closures for Leather wraps. Wow, these are beautiful! Thanks for the giveaway opportunity. I would absolutely love to win this! My 18 yr old granddaughter would love something made with colorful beads. Love me a Stinky Dog! Love her flowers and sugar skulls. Lots of wonderful beads. Amazing and beautiful beads. I hope I win!!! You have SO many yummy beads, it would be so fun to create with them!!! I love beading. I love your site and all the beads you promote. I am lucky to still have my cats and my home especially after being robbed of all my electronics and all of my beads and finished orders. Material items can always be replaced. With Halloween around the corner, deginitely would love the sugar skulls. And then there's my favorite season, fall, so definitely the owls too! I would love to get some of these beads! I love the variety ~ some cool beads! I would love to win and I love the seahorse beads they are adorable. I got some beautiful bead assortments here the last time I ordered.....and a great little cat pendant. Love LOVE LOVE this store. I just received my first order and have the beads laid out awaiting inspiration. I did share on facebook. I did share on Pinterest https://www.pinterest.com/envoy13 thanks for the opportunity Kitty!! It's the 'odditiy' from antiquesnoddities. It would be marvelous to win dollars to buy even more Stinky Dog beads. I think I'm greedy. Hope to hear from you. Kitty and Stinky Dog Beads have always been one of my most preferred suppliers. 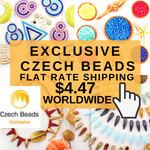 The beads are high-quality and reasonably-priced, not to mention beautiful!! Love all of your yummy beads. Thank you for sharing all of them with us. Very cool beads. Would love to creat with them. Pick me!! I love your beads! I love all of your sea glass. I have such a great collection for my jewelry making. I would love to add more to my stash. How generous! Love Stinky Dog Beads! I'm still kicking myself for not getting some of those tin earrings. They were beautiful. Wish you would get more of those. I love the hooters! I would get me some of those if I won! Pick me please! I know exactly what I'd buy. One of my top 5 Bead sources! Such beautiful and unique beads. Love love love my Stinky Dogs! Love the choices here. Thank you Pearl. Blog follower: zoowatcher10@yahoo.com, Debbie Skwirsk. Great collection of beads! Unfortunately, two groups of beads I'm interested in are sold out so I left my contact information. I love your beads. So many unique gems to choose from! Owls AND seahorses ~ air and water ~ my favorite inhabitants of each! I love Stinky Dog Beads, got my first order fro them the other day.. Will def. be ordering from them again. Love the beads in my first order and can't wait to get my hands on more goodies! Great place for unique items for leather! Love Stinky Dog Beads haven't had a chance to grab some up but this would give me the opportunity to do so! Definitely loving those Sugar Skulls and Hooters!! I also have ordered fro Stinky Dog Beads before and everything is first class....products and customer service are exceptional. STB's can class up any project!!! I have had the privilege to have some of Stinky Dog's Beads and love them...MORE PLEASE! Thanks for the opportunity to win some! Wow! I have had the privilege to own some Stinky Dog Beads and am thrilled to be given a chance to win more! Thanks so much for this opportunity, WOW! It's been awhile since I visited the Stinky Dog site for the first time in quite awhile. There are so many new things to see! Wow. Stinky Beads has some of the most colorful and fun beads around! Im a blog follower, and Facebook. I hope I win. I would love to win this GC! Her bead shop is fabulous! And her customer service is superb. I'd love to shop there again, and for free would be even sweeter! What a cool oppurtunity!!!! I would flip out if I actually won. I've been eyeing down quite a few items. My email is thefrazzledmermaid@gmail.com and my name is Amanda. This is so cool!!!! I would love a chance to win this. My email is thefrazzledmermaid@gmail.com. thanks! 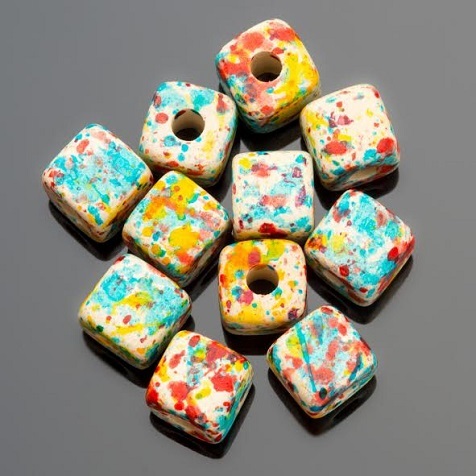 The beads and findings at Stinky Dog Beads are great! I enjoy the funny remarks in the emailed ads for us to see the latest batch of beads. Thanks bunches for this giveaway . I've only just discovered Stinky Beads and I love your wide selection of gorgeous beads! I am in the process of making jewelry from my first order! It IS hard to decide what to buy, so many beautiful (and unusual) beads! I love Stink Dog Czech beads! Thanks for the opportunity! I can see a number of items from StinkyDogBeads that I would love to add to my jewelry-creating stash to enhance my designs! Stinky Dog Beads has a fabulous selection of uncommon beads - sure would love to win some of them!!! Cool. I'll probably get some owl beads for an owl-loving friend who is undergoing chemotherapy and headed for a double mastectomy in the coming weeks. Are they double-sided, or plain on the back? Thanks for the giveaway Pearl! I'm both a blog subscriber and I put it on my Google+ page. I love so many of the fun an unique beads! It would be hard to choose! You have great products with fantastic colors. I sure hope to win this fabulous prize! Thanks so much for the chance! I love the rainbow of colors of sea glass beads! I have ordered from Stinky Dog Beads and found their products are only surpassed by their customer service. This is a generous giveaway . SDB's can upgrade any project. Love all the patinated metal! 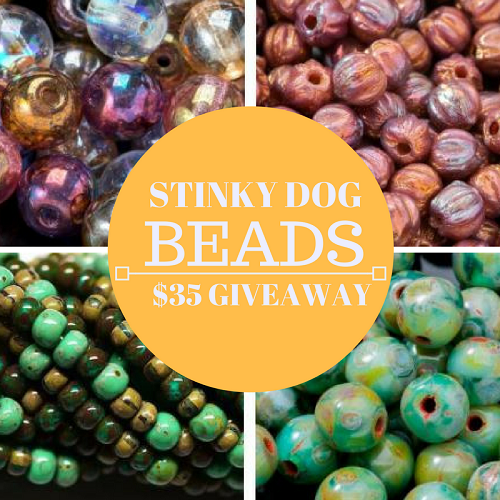 I love Stinky Dog Beads and would so love to win this giveaway! I follow Beading Gem on Google+ and Facebook too! Thanks! Your beads are exquisite and unique! When I peruse the sight, I know I'm in the right place because I'm looking for something different that stands outside the familiar. I feel like a kid in a candy store, ooooo and ahh, can't make up my mind, but know I want them. I say, just get the beads, the design will come, and I sketch out my vision for a new piece. 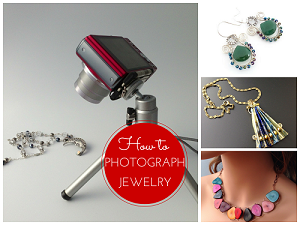 Your beads inspire my creative, jewelry designs! That is awesome! I just discovered StinkyDog Beads and I'm loving the variety!